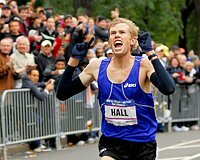 "He can set a World record in the marathon, but I would like to emphasize winning over fast time. I like to coach a winner. Sam (Wanjiru) never gives up during the race. Such characteristic is important for the marathon." -Toyota Kyushu Ekiden coach, Koichi Morishita, the silver medallist at the 1992 Olympic marathon on his pupil Sam Wanjiru. 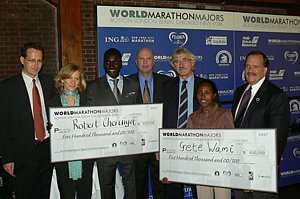 The article is a good read and says that Wanjiru may skip a spring marathon which would prevent him from running the Olympics for Kenya. Kenyan Sammy Nyamongo Has Run 3 Marathons in 3 Weeks but He Still Aspires Greatness It's a hard way to eke out a living. A Different Type of Race: Santa Speedo Run in Boston a Success The run is self explanatory. Get in a speedo, where a Santa hat and run through Boston. 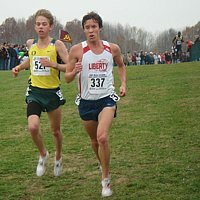 Save Ohio Track and Field Blog Launched (And They Have a Billboard in Ohio as Well) The blog is pretty interesting. They point out how many schools can axe more $$$ from women's sports (scholarship sports), but more men's #s and then be in compliance with the proportionality test of Title IX. The proportionality test is a joke. If we were advising schools to beat the system, we would put 100 girls in XC/track which counts as 2 or 3 sports.